MANAGUA, Dec 5 2016 (IPS) - A group of women farmers who organised to fight a centuries-old monopoly over land ownership by men are seeking plots of land to farm in order to contribute to the food security of their families and of the population at large. Matilde Rocha, vice president of the Federation of Nicaraguan Women Farmers Cooperatives (Femuprocan), told IPS that since the late 1980s, when women trained in the Sandinista revolution organised to form cooperatives, access to land has been one of the movement’s main demands. According to Rocha, as of 1997, the organisation has worked in a coordinated manner to fight for recognition of the rights of women farmers not only with regard to agriculture, but also to economic, political and social rights. Femuprocan, together with 14 other associations, successfully pushed for the 2010 approval of the Fund for the Purchase of Land with Gender Equity for Rural Women Law, known as Law 717. They also contributed to the incorporation of a gender equity focus in the General Law on Cooperatives and to the participation of women in the Municipal Commissions on Food Security and Sovereignty. For Rocha, this advocacy has allowed rural women to update the mapping of actors in the main productive areas in the country, strengthen the skills of women farmers and train them in social communication and as promoters of women’s human rights, to tap into resources and take decisions without the pressure of their male partners. “For rural women, land is life, it is vital for the family; land ownership and inputs to make it productive are closely linked to women’s economic empowerment, to decision-making about food production, to the preservation of our environment, and to ensuring food security and protecting our native seeds to avoid dependence on genetically modified seeds,” said Rocha. 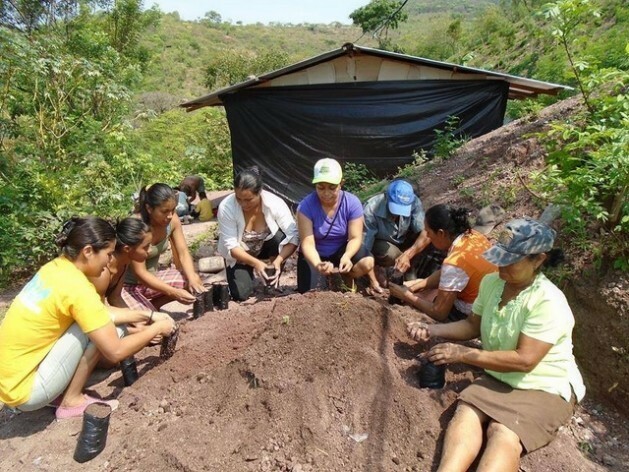 Femuprocan is the only federation in the country solely made up of women farmers: more than 4,200 members organised in 73 cooperatives in six of the country’s departments: Madriz, Managua, Granada, Región Autónoma del Caribe Norte, Matagalpa and Jinotega. Rocha believes the progress made has been more qualitative than quantitative. In 2010, when they pushed through Law 717, an estimated 1.1 million women lived in rural areas, and most of them owned neither land nor other assets. The law was aimed at giving rural women access to physical possession and legal ownership of land, improving their economic conditions, boosting gender equity, ensuring food security and fighting poverty in the country, estimated at the time at 47 per cent. Nicaragua currently has a population of 6.2 million, 51 per cent of whom are women, and 41 per cent of whom live in rural areas, according to World Bank figures. Data from the Household Survey to Measure Poverty in Nicaragua, published in June by the International Foundation for Global Economic Challenge, indicates that 39 per cent of the population was poor in 2015. The poverty rate in urban areas was 22.1 per cent, compared to 58.8 per cent in rural areas. According to the international humanitarian organisation Oxfam, only 18 per cent of the rural women who work on farms in Nicaragua own land, while the rest have to lease it and pay before planting. “Access to land ownership is a pending demand for 40 percent of the members of Femuprocan, which represents a total of 1,680 women without land,” said Rocha. The struggle for access to land is an uphill battle, but the organisation is not giving up. “In 17 municipalities covered by our federation, 620 women are active in the process of searching for lands for our members. Not only women who have no land, but also women who do are engaged in the process of identifying lands to make them productive, as are other governmental and non-governmental organisations,” she said. One of the members of the organisation told IPS that there has been no political will or economic financing from the state to enforce the law on access to land. “How many doors have we knocked on, how many offices have we visited to lobby, how many meetings have we held…and the law is still not enforced,” said the farmer, who asked to be identified only as Maria, during a trip to Managua. “The problem is that the entire legal, economic and productive system is still dominated by men, and they see us as threats, more than competition, to their traditional business activities,” she said. Other women’s organisations have come from rural areas to the cities to protest that the law on access to land is not being enforced. In addition to having to lease land, the women who belong to the organisation have in recent years faced environmental problems such as drought, dust storms, volcanic ash and pests without receiving the benefit of public policies that make bank loans available to deal with these problems. “Six years ago, Law 717 was passed, ordering the creation of a gender equity fund for the purchase of land by rural women. But this fund has not yet been included in the general budget in order for women to access mortgage credits administered by the state bank, to get their own land,” Fernández complained in May. The Nicaraguan financial system does not grant loans to women farmers who have no legal title to land, a problem that the government has tried to mitigate with social welfare programmes such as Zero Hunger, Zero Usury, Roof Plan, Healthy Yards and the Christian Solidarity Programme for food distribution, among others. However, sociologist Cirilo Otero, director of the non-governmental Centre of Initiatives for Environmental Policies, said there is not enough government support, and stressed to IPS that women’s lack of access to land is one of the most serious problems of gender inequality in Nicaragua. “It is still an outstanding debt by the state towards women farmers,” he said. Nevertheless, data from the Food and Agriculture Organisation (FAO) indicates that Nicaragua was one of 17 Latin American countries that met the targets for hunger reduction and improvement in food security in the first 15 years of the century, as part of the Millennium Development Goals. According to the U.N. agency, between 1990 and 2015, the country reduced the proportion of undernourished people from 54.4 per cent to 16.6 per cent.